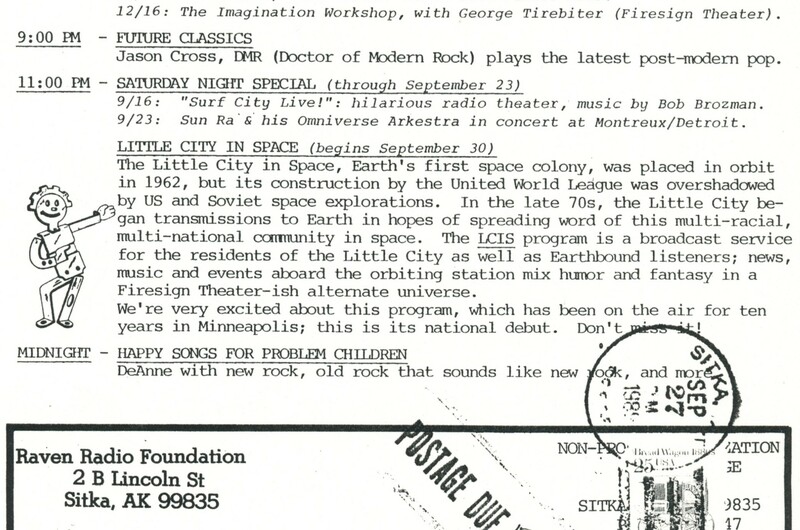 Sound Affects, A Radio Playground presents The Post-Void Radio Theater’s Little City in Space Show! High atop the Arthur Bagg building in Communications Central, hosts Stu, Pete and Jerry bring you news and entertainment from satellite LCS-1, featuring The Paul Bunny Report; paranormal investigator Alabama Neptune; public service announcements; commercials for Old Dotage Fig Paste, Mama Steve’s Rumba Toast, and Purago Paper Towels. Listen to KFAI Sunday July 27 at 9:30 p.m. (cst), or catch the show in station archives for two weeks. (right) A resident alien from the Fubar Omniverse models the ultra-rare Little City in Space T-shirt. (below) LCS radio beamed from outer space to Sitka, Alaska.